In this latest issue, the Iran Human Rights Review focuses on women and their on-going struggle to access human rights. The review contains contributions from human rights lawyers, activists and defenders, from both inside and outside of Iran. 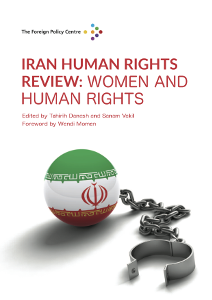 The Iran Human Rights Review: Women and Human Rights, focuses on the need to recognise both the current plight of women in Iran and their role in securing a culture of human rights in Iran despite the legal, cultural and social challenges they face.